White vinyl edition of 300 in a hammer press sleeve with sticker. The static brothers first stumbled across Jess when she contributed the stand out track ‘New Skin’ to The Memory Band album ‘Oh My Days’. Sometime later whilst drinking ‘Salty Dogs’ and arguing if the Blue Horizon label was better than Giorgio Gomelsky’s Marmalade imprint Jess offered to record a version of Koko Taylors ‘Voodoo Woman’. So here it is Van 244. As much Vinegar Joe as Julie Driscol, Jess Roberts featuring Dave and Barry Hyde, Neil Bassett (Futureheads and Hyde and Beast) and Lucas Renney (Ex. Golden Virgins). “A Good Soul in Good Times” by Jess Roberts and Andy Lewis (Paul Weller Band) on Acid Jazz Records. 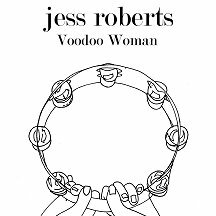 “Waitin So Long” by Jess Roberts and The Pimptones on RecordKicks.